Dana Feagin, award-winning pet portrait artist, is our featured artist for June. Dana is an oil painter completely focused on animal art, capturing their interesting and amusing expressions on bold backgrounds. Her work can be seen in Studio 3, as well as a special display upstairs featuring paintings of animals from Sanctuary One, a non-profit care farm in Jacksonville, OR. 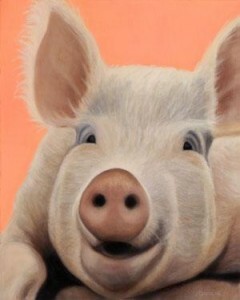 Ten percent of her sales from these originals, prints and cards is donated to Sanctuary One to assist with animal care. During the June Art Walk, Dana will be greeting visitors in her studio and answering questions about her processes. Enjoy live music by Garrett Baxter and discover art and artists on all three floors of the Art Center.